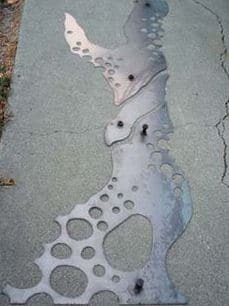 Sandblasting is a method to texture the surface of hardened concrete on patio, walls, columns, driveways, floors to remove paint or expose aggregates. The extent of sand blasting ranges from light cleaning to a deep cutting operation that exposes aggregates to around 2 cm. The equipment required for blasting might change based on the specified cut depth. If only the surface is needed to be lightly removed, then any sandblasting tool or equipment can execute the work properly. 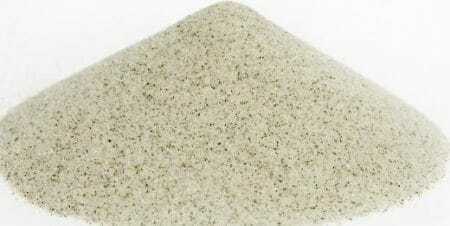 However, if the designated texture required a fairly deep cut, then the equipment capacity will have substantial importance for the success of sand blasting operation. Table 1 provides desired specifications for Air compressors used for sandblasting. The proper time to conduct blasting is a question of economics. The concrete matrix will be easier to cut in the first 24 to 72 hours after casting. In order to prevent damages due to sandblasting operation some measure need to be considered in and around sandblasting area. For example, remove all objects or items that can be move out, cover items that cannot be moved out, and cover surfaces; windows, and any exposed surfaces around the operation area to protect them and keep their cleanness. If sandblasting is carried out in closed area such as garages, then it is necessary to provide adequate ventilation. 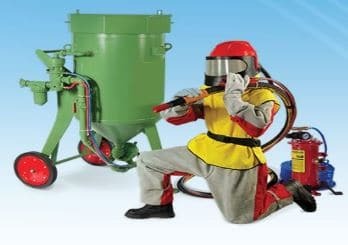 Worker need to use safety goggles, suits equipped with hood, and respirator so as to prevent inhaling dust particles during sandblasting operation. Stencils are installed to achieve certain texture, so these stencils shall be fixed prior to the beginning of sandblasting process. 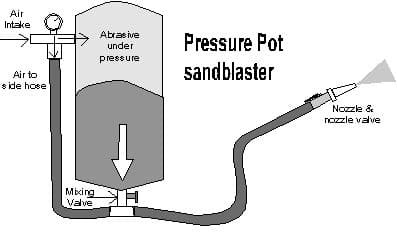 Close all the valves of sandblaster machine and fill its tank with sand or other available materials designed for sandblasting such as soda, silica or silicon dioxide, steel grit, glass bead, and bristle blasting. Turn on the compressor and set low pressure at the beginning; possibly a range of 275 MPa to 0.689 MPa. Direct the nozzle at the concrete, but it should be keep at a distance of 20cm to 40 cm away from the body of the operator. After that, start sandblasting of concrete surface top to bottom in order to achieve even coverage. The nozzle shall be at distance of 30.5cm from the surface till the concrete is properly cleaned and required texture is achieved. 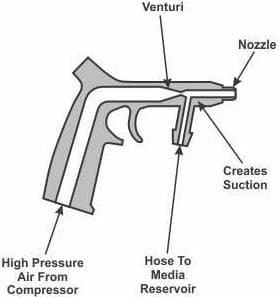 An experienced operator can quickly determine the nozzle position to produce the specified surface finish. Employ short burst of sand for difficult area and sweeping motions for other parts of the concrete. Clean the surface with compressed air after finishing the job. Collect all the utilized sand in a wheelbarrow and haul it away.